This is the Indecision/Shai Hulud on green out of 250...I think it's out of 250. I'll try and get another collection photo up soon. Edit - Jesus christ, no wonder I always thought there was a blue and a green made of this record. Look at the pictures! They look totally different. That's amazing haha! And the 39/Smooth Test Press from Green Day. I'm not a huge Green Day fan, but I did spend a lot of time during my youth in Berkeley Ca. So of course I grew up I listening to Kerplunk and this LP. It's definitely an incredible score to find this record for so cheap. 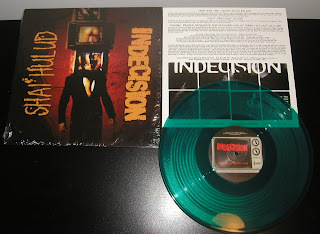 The Indecision/Shai Hulud on green is out of 230.